I know what it's like when you start to blunder. Your game goes south and you can't stop making mistakes. Here are two three-minute (G/3) online blitz games in which it happened to my opponents. My play was by no means stellar; I just wasn't as bad as they were. 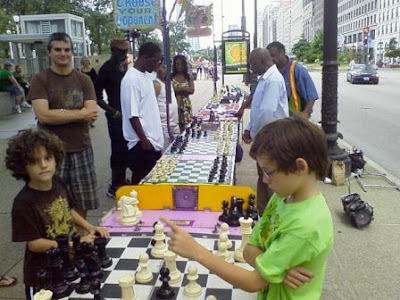 You could easily have concluded that Chicago was the chess capital of the world today, if you did as I did and took to the streets on this glorious late-July Sunday. First I visited the chess pavilion at North Avenue and the lakefront, where about ten games were in progress at all times throughout the afternoon. FM Aleksandar Stamnov and another gent were playing some kind of game that involved playing cards and chess pieces. I didn't understand it. 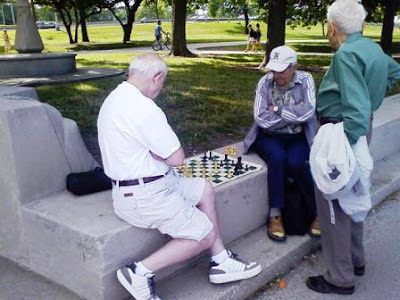 Chess expert and pavilion mainstay Ron Washington, who usually cruises easily to victory there against unsuspecting patzers and tourists, had his hands full playing a series of three-minute blitz games against a young man who was every bit his equal. After that it was off to Cecil Locke's chess tables in front of the Art Institute, which were rife with activity as usual. I played a boy named Alexander from Newberry Academy. Though I had a material advantage he lured me into stalemate and the game ended in a draw. He was a solid player, though he's not in a chess club because he says there's none at his school. All this talent shouldn't go to waste. Anybody at Newberry up for starting a chess club? Congratulations to Chicago-area chess prodigy Eric Rosen, who beat Kevin Bu in the "Armageddon" (I love that term) playoff to win the U.S. Junior Open in Milwaukee this past weekend. Eric, a freshman at Niles North High School, and Kevin, were at tied at 4.5/5 at the end of regulation play. Details from the U.S. Chess Federation here and below the video of the exciting playoff round by Chad Hirsch and courtesy of Chessmom64. MOSCOW (AFP) — Chess legends Garry Kasparov and Anatoli Karpov are to relive their epic 1984 world championship duel 25 years on by contesting a new match this September in the Spanish city of Valencia. "It will be 25 years since the start of the matches (against Karpov), there is nostalgia about this unique event," Kasparov, now a Russian opposition politician and Kremlin critic, told AFP. "This is where modern chess began." The September 21-24 match is not expected to reflect the suspense of their first encounter and will be more of "a ceremonial tournament", Kasparov said, explaining there would be a time-limit on moves. . . .
For the third year in a row, chess will be a part of the Hyde Park 4th of July festivities in Nichols Park. After crashing the picnic in 2007 and 2008 by simply showing up uninvited (though not unwelcomed) with chess equipment, this year we'll be there officially. The neighborhood 4th of July parade down 53rd Street ends at the park, and the celebration there starts when the parade ends. If you're there, please stop by for a game of chess. We'll be in the middle of the park, around the two concrete chess tables by the big-kids playground. 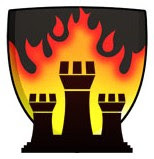 We'll be playing chess and plugging the Ray School Club, the Chicago Blaze, and some ill-defined fledging neighborhood chess initiative I hope to launch. See you then.